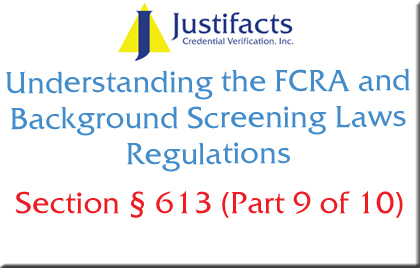 Section 613 of the FCRA protects employees from adverse information which would affect their employment. This section of the FCRA instructs consumer reporting agencies about reporting adverse public records. 2. Maintain strict procedures designed to ensure that whenever public record information which is likely to have an adverse effect on a consumer’s ability to obtain employment is reported it is complete and up to date. For purposes of this paragraph, items of public record relating to arrests, indictments, convictions, suits, tax liens, and outstanding judgments shall be considered up to date if the current public record status of the item at the time of the report is reported. Consumer reporting agencies need to report complete and up to date information. We must keep this section of the FCRA in mind when using any private database of public information. Although Justifacts National Criminal Database provides a great deal of useful information, the information may at times be outdated and thus violate Section 613. In order to remain in strict compliance with the FCRA, Justifacts verifies case information found in our National Criminal Database with the originating jurisdiction. Employers must be wary of any consumer reporting agency who offers “instant criminal searches”, these searches may carry a risk of violating Section 613.